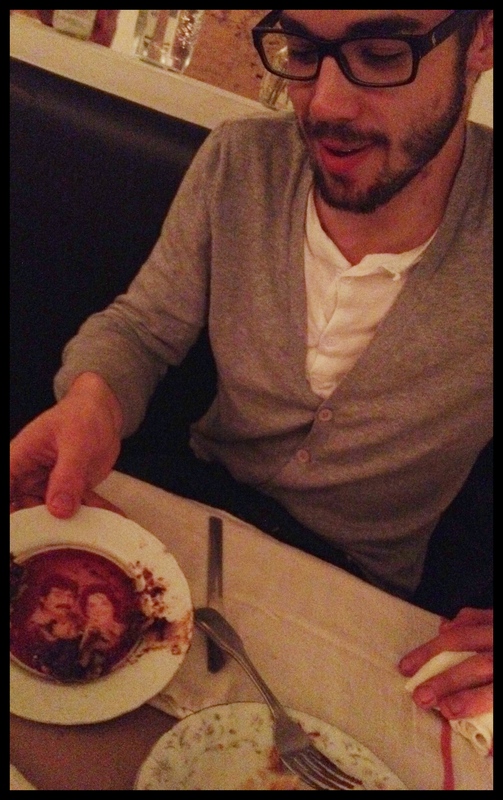 Did I mention that Brad has chef friends all over Los Angeles? It’s a definite perk of being married to a very personable chef. He knows everyone. And when we go to the Farmer’s Market on Wednesdays, he talks to every chef he sees. It’s like this exclusive club. 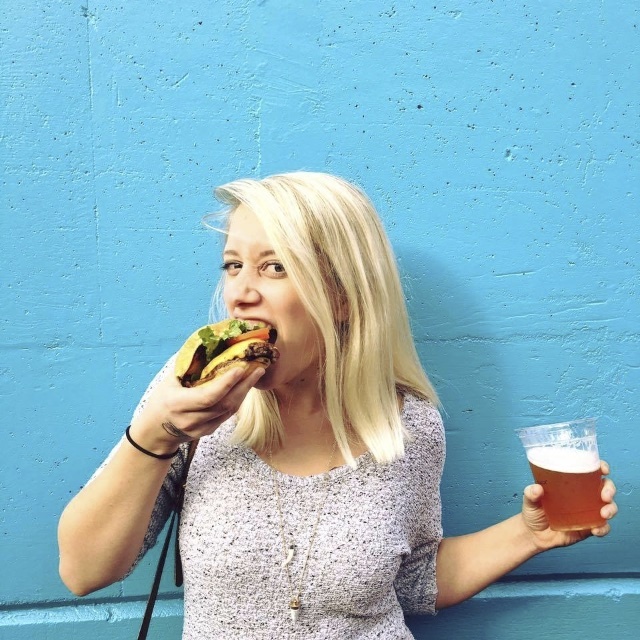 They talk food and sous chefs and line cooks and vendors and this week’s features and what’s looking good at the market today…. This week he even chatted up Travis, the chef from Gjelina, and – after schmoozing for a bit – invited him in to Bar Pintxo. I wish I’d gotten a picture of those two pretty boys chatting it up. Anyway… Last week at the Farmer’s Market, we ran into Kris and Brian of Wolf In Sheep’s Clothing. We see them there almost every week, but the guys got to talking about how Brad hadn’t been back since their original tasting menu. I went back with Suzi recently and got to try some of the newer menu items, but Brad was missing out. So of course, we had to go for dinner that very same night. And while everything was lovely and the food was fantastic, I completely forgot to slow down and think about writing about it all. I do know I was smart enough to snap a pic of this dish. This was the most amazing Maple Cornbread I’ve ever had. Topped with quail. 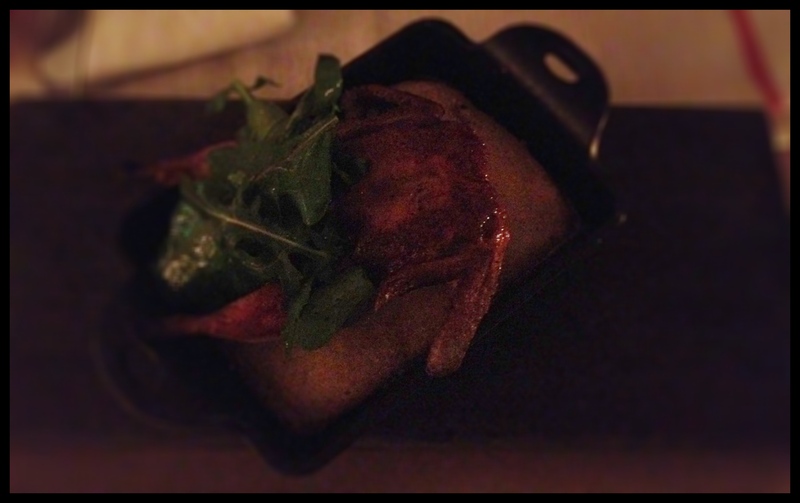 Tasted like pancakes – well, if it were appropriate for pancakes to be topped with quail – for dinner. And I also made sure to document dessert. 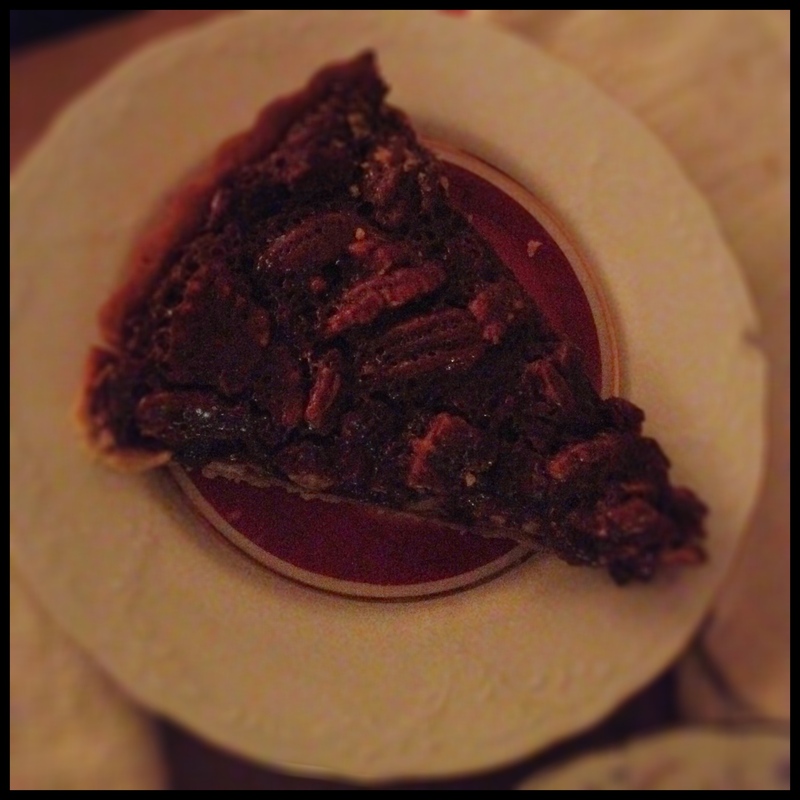 The amazing Chocolate Pecan Pie. First of all, it was amazing. And although every time I hear “Pecan Pie” I begin quoting “When Harry Met Sally”, I barely had time to pull my routine with this slice. You know what I’m talking about, right? Look at him going for it in this picture. But wait, what is that? Could it be? 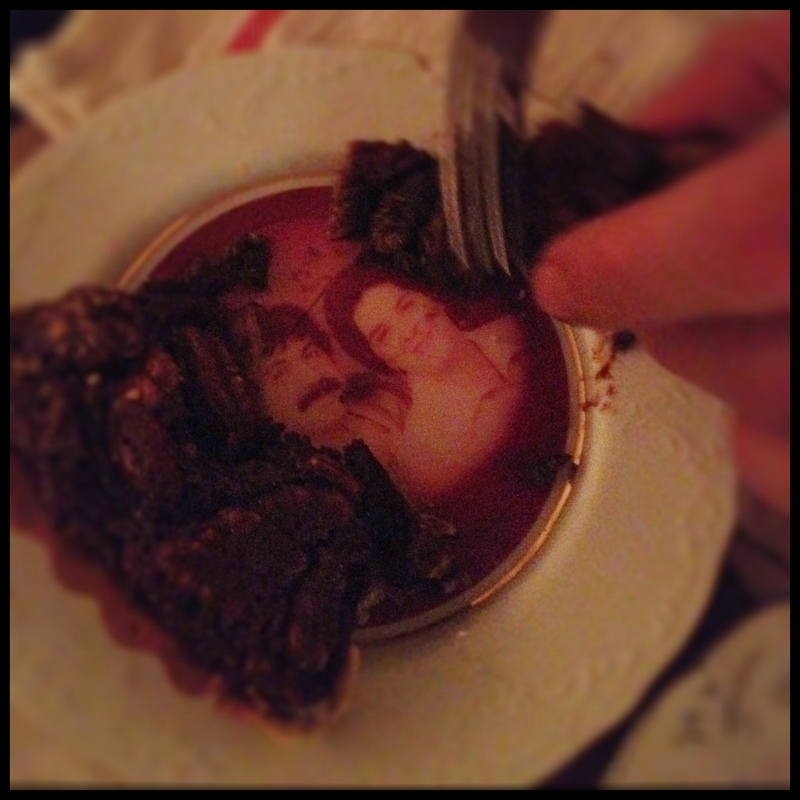 The mustache plate???!?! Now a little chipped and “saved only for VIP” (which made me feel awesome, thank you very much), the mustache plate has still not lived up to its opening weekend reputation of the plate “Most Likely to Be Stolen“. Thank goodness, because it is the coolest plate ever. 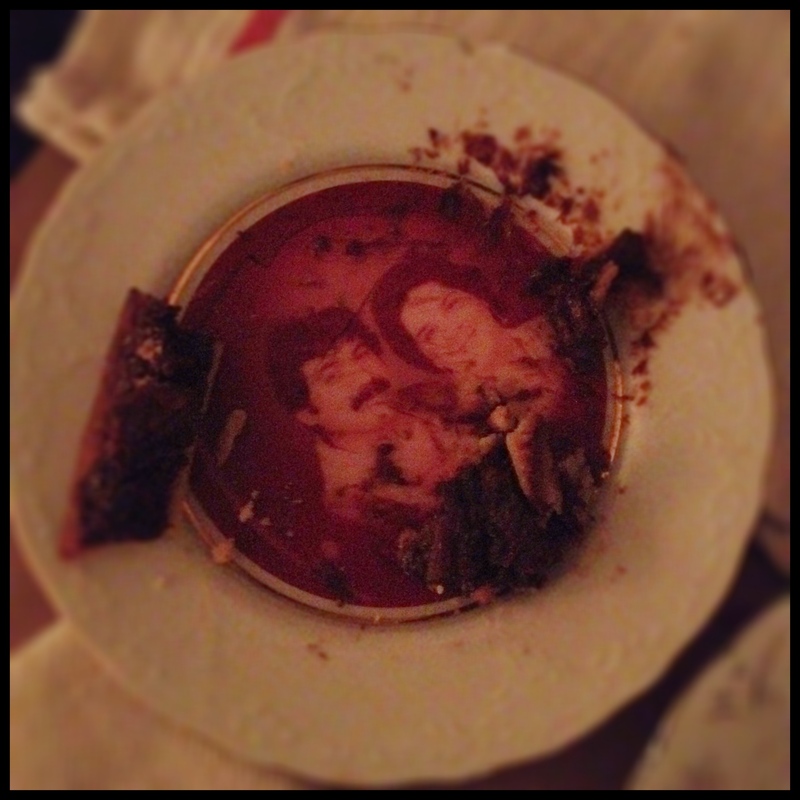 Brad and I are considering making a set with our faces on them. But he has to shave his beard into a mustache. And then we have to get them circulated into cool restaurants around Los Angeles. 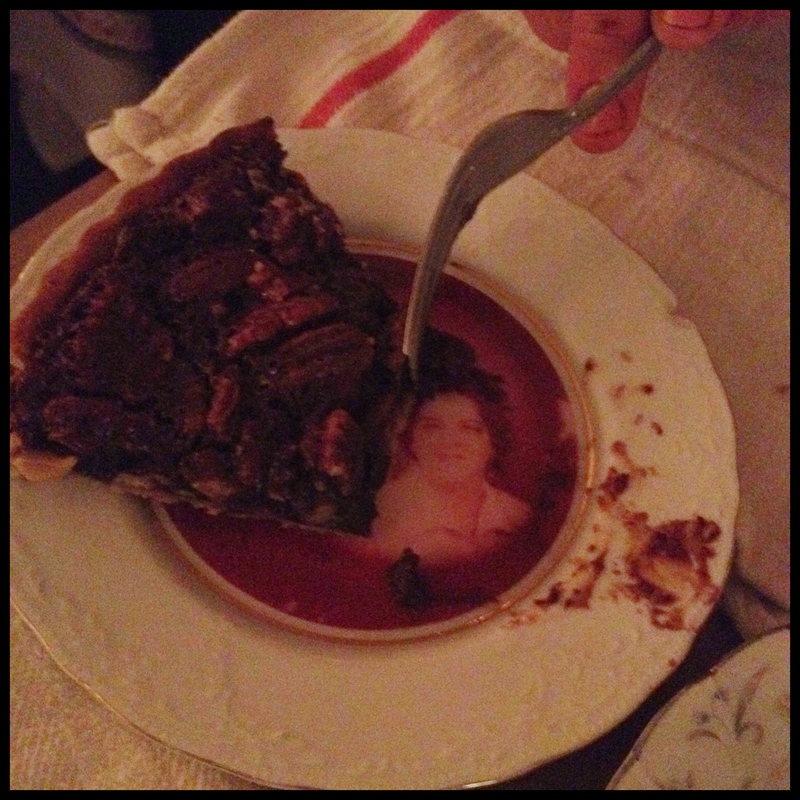 Anyone know of a good place to get your portrait printed onto china?